Sweet truck! You should be their truck mascot, you match their sign perfectly. Lol. Do you have spacers on with the stock rims? Well that looks easy. I was going to leave them on but didn’t really want to slip and cut the leather or plastic. Definitely just going to pull them. Now to decide which color to do. How did you get these off? Are they just clips? Or screws somewhere? Did you buy the wheels and tires there? I had something similar happen. Not at Americas Tire though. Luckily mine weren’t actually gouges just major socket rubbing that didn’t come off with minor rubbing. I took them back and the salesman took one look and said he should have ordered me different lug-nuts. I can’t remember what they’re called but they’re skinnier so they don’t have to use such a large socket to get in there. They took care of it. Pulled all my wheels off and buffed around every single lug-nut with wax and changed out my lug-nuts. I bought the wheels and tires from them and it was my 5,000 mile rotation and oil change. They didn’t have any issue putting them on and there were no marks with the initial install just the second go around. I think they were good though since I specifically told them to be careful with my wheels when I dropped it off. So they weren’t shocked when I showed them the issue. Also, I have black wheels around the lug-nuts just like you. I have a 3.5” Superlift. 3 MPG drop because of the tires. I ran the stock ones with the lift for about a year with no change in MPG. TOYO AT/2 305/55/R20 Maverick Ultra Wheels +18 offset (Didn’t come in 0 offset unfortunately, which is what I would have liked). Rubs only the sway bars on full lock. Oooo I would double check that. I think Chevy changed the bolt pattern mid 2000’s. But it might have only been the 2500 trucks. 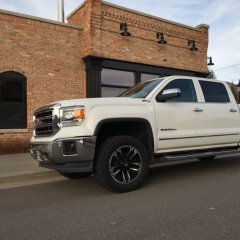 Wanted to switch from 2002 Chevy Silverado 2500 to 2013 GMC Sierra 2500 and they wouldn’t fit. But I did move my stock 20’s from my 2015 GMC Sierra 1500 to my 2013 Chevy Suburban and it worked great! I have the stock 16’s from my 2013 1500 Suburban that are in good shape. Pm if your interested and i can send you pictures. I have the Open Country AT/2. There was a little more road noise and roughness (most likely going to a 10 ply tire) compared to the stock SRA’s and a 3mpg mpg drop but I love the width and aggressive look of the tire. Here’s a look at a whole bunch together so you can see tread pattern and side wall look. The text is reversed on some of them just because of what I could find and I wanted them to all be the same direction. This! It's not about the actual start button, it's the automated features that are associated with it. Stock or quiet Muffler with Headers? That actually sounds really good on the video but I'm guessing in real life it's louder. And I appreciated the fact that you weren't holding the camera. Makes me cringe sometimes when people are trying to hold the camera on the speedometer or something else and driving 100 miles an hour. This is a cool looking stance! A little wider than I'm looking for but still cool! 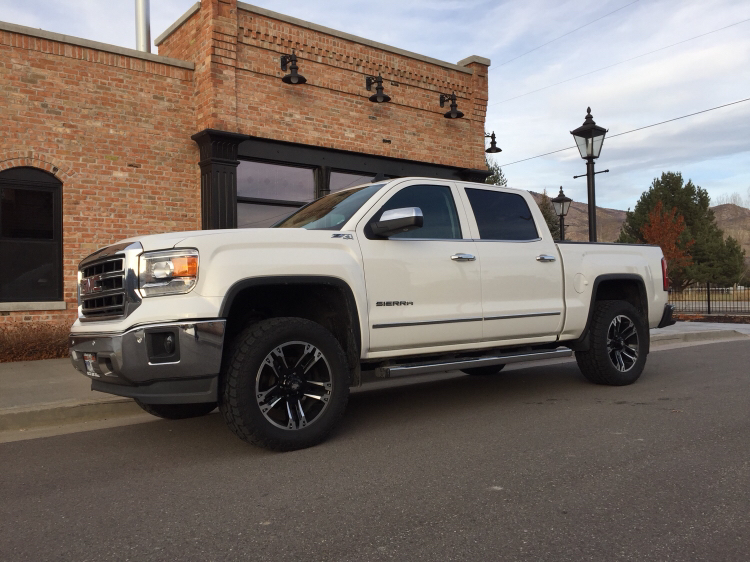 What's all the details on your tire and wheel setup? I ordered a set for my Sierra on Monday, email notification saying it shipped Tuesday, and got them today, Thursday. Was not expecting it quite so fast since their shipping said 6-10 days. They also shipped from GA to UT so that's fast! Nice Job TRS! Yep I bought the TRS fog lights. The Diode Dynamic fog lights are HID's with ballasts and harnesses and I didn't really want to deal with that. Pretty much why I still don't have the Morimoto HID kit because of the install. Decided it was best I didn't add an HID project to my list when I still haven't done the headlights. Lol. Thanks for the GroupBuy Horacio! How could this be an answer? Speed limits range from 25 to 85. This doesn't help at all unless your driving over 85 and getting the vibration issue. Maybe your getting vibes at 27, 33, 47..... Fix. Decelerate or accelerate to the closest limit. Ha Ha Ha! What speeds is it vibrating anyway?